In 2018 the Ombudsman for Children’s Office published Molly’s Case, a report detailing a complaint about a child with a disability who is in foster care. Molly was born with Down Syndrome and severe autism. She was abandoned at birth by her biological parents and has grown up with her foster family after being placed there when she was four months old. Molly’s foster carer made a complaint to us about the level of supports and services being provided by Tusla and the HSE to meet Molly’s needs. We found that this was a problem facing 471 other children with a severe or moderate disability who are in care. Twelve months on we are returning to this case and tracking the progress made by the HSE and Tusla on commitments made in response to last year’s report. “When we published Molly’s Case in January 2018, we found that there was a lack of co-ordination between Tusla and the HSE which meant that services and supports provided by both organisations were insufficient. Neither agency saw Molly as both a child in care and a child with a disability. “We found that neither Tusla nor the HSE had a good enough system in place to ensure adequate supports were being provided to these vulnerable children and to their carers. “Since last year some definite progress has been made, particularly for Molly herself but not enough has changed for the rest of the children like Molly within the care system. In relation to Molly’s particular situation, Tusla has worked closely with her foster carers to ensure that the supports she requires are in place. However, the working relationship between Tusla and the HSE, and the impact that this is having on the welfare of children with disabilities who are in State care, is still of concern. 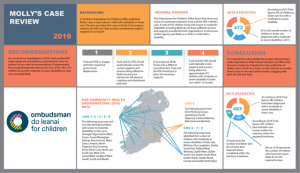 “Tusla has identified 483 children with moderate or severe disabilities in state care, and they have outlined a timeline of care plans already provided to most children. However, there is no consensus with the HSE that this is the number of children affected due to a failure to agree a common understanding of what is considered a child with a moderate or severe disability. “The HSE does not have disability managers to undertake case management roles and the business case to secure enhanced payments for foster carers of children with a moderate or severe disability which was promised by Tusla in 2018 is outstanding.